During a recent press conferences, Belarusian TV propagandist Yury Prakopau asked Belarusian President a question: "Why Russia conducts unfair policy towards Belarus, and doesn't help it in the time of crisis, as the EU helps Greece?" Lukashenka answered: "Yury, don't provoke me. I have enough as it is. Everybody understands it anyway. We'll overcome it". After the presidential election of December 19 Lukashenka temporarily stopped the anti-Russian information campaign and accused the West of supporting a coup d'état in Belarus. During that period the main topic of Yury Prakopau's shows was devious intentions and actions of the West. Lukashenka simmered for a long time when Moscow was making demands to sell enterprises to Russian companies and make other steps towards genuine integration, as the Kremlin sees it. Now, Lukashenka "lets off the steam". Once again, an anti-Russian information campaign unfolds in Belarus. 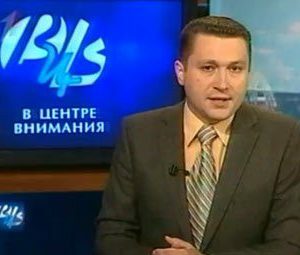 Yury Prakopau is a presenter of the evening news on the First Belarusian State Television Channel. He can be called a mouthpiece of the Presidential Administration. Lukashenka calls Prakopau by first name only: "Yury", as a close collaborator. Lukashenka gave Prakopau the opportunity to say in plain language what he was thinking himself of the relations with the eastern neighbor: "The Kremlin ideologists gave an order to their media: say either bad or nothing about Belarus". "All claims of the Russian side to the president of Belarus are explained by the fact that he does not agree to sell out the country. The goal of the Russian policy is to force selling enterprises to oligarchs. They robbed their own country and now they are eager to get to Belarus". According to Prakopau, the ‘silent protest actions’ in Minsk and other large cities of Belarus on June 15 and June 22, 2011 were “stage-managed in Moscow, like all other anti-Belarusian deeds.” According to him, “the Kremlin experts believe that the Belarusian authorities will lose their ground, facing modern web-technologies.” Prakopau established a linkage between the insidious plans of Russia, the silent protest actions, and the stirred up ‘Tell the Truth!’ civil campaign. He was trying to convince the audience that these were the parts of the same system. Dwelling about a recent silent protest action, Prakopau noted that several hundreds of drunken youngsters participated in the event. “The leader of ‘Tell the Truth’ civil campaign Neklayev was there. Having got out of jail, he fell back into his old ways,” he added. Prakopau was trying to drive the audience at the notion that Uladzimir Neklayev and other leaders of ‘Tell the Truth’ civil campaign might be sent back to prison, since they act in the interest of Russia and its oligarchs. Actually, the on-line announcements and news stories of “Revolution through the Social Network” civil campaign, calling the Belarusian people to take part in the silent protest actions, must have been created by professionals. Hardly could bloggers deal with production of such materials. However, there is little chance the silent protest actions will grow into large manifestations against the Lukashenka regime. Several thousands of protest action participants in Minsk and several hundreds of people in the regional centers are quickly dispersed by Lukashenka’s security agents. The silent protest actions will not cause the change of power in the country. Still, they can lead to the appearance of new political prisoners in the Belarusian jails. Obviously Russia is eager to drive Lukashenka into a corner and catch him by the throat there. The Kremlin is interested in filling the Belarusian jails with new political prisoners. The news programs of Russian TV channels pay serious attention to the crisis in the Belarusian currency market and the silent protest actions nowadays. “The Belarusians go out to the streets,” the Russian ‘REN-TV’ reported on June 28, 2011. “The Belarusian rubles have turned into “funny money” and people spend days and nights in queues for the foreign currency. The people stormed into stores. The situation became uncontrolled,” the Russian “NTV” TV channel’s news announcer noted on June 29, 2011. “Russia’s subsidies to Belarus have amounted to USD 60 billion over the recent years.The Belarusian economy will not survive without the Russian assistance,” a Russian political scientist Andrei Suzdaltsev said. “Now, the only remaining chance for Lukashenka is to appear under Russia’s wing. Should Belarus introduce the Russian ruble as its monetary unit, the Belarusian economy will become stable all at once and get rid of quite a few current problems immediately,” another Russian political scientist Viacheslav Nikonov summarized the general idea at the end of the program. we are attacked and tested for hardness nowadays. Somebody hates us for failing to march in the common formation and dance to the Brussels tune. Others regard us as an unpleasant example, thrown in their teeth. The country hasn’t been plundered. We don’t have a gap between the provocative luxury and the flagrant poverty. Somebody feels infuriated at the impossibility to buy and sell public positions and spend billions of money from public funds to offshore zones here. Our enemies treated certain problems we faced in the financial and economic field as a signal to action. Some types, who name themselves politicians through a misunderstanding, inside Belarus and abroad keep relishing the emerged difficulties so enthusiastically, as though they have taken their hand in creating the plight. Calm down! You won’t manage to catch the desired golden fish in the troubled waters. Even more so you won’t be able to force us to our knees. Lukashenka treats the demand of the West to release the political prisoners as a much smaller danger to independence of Belarus in comparison with Russia’s demands to sell the industrial enterprises, unify the monetary systems, and take other steps towards the ‘real’ integration, as seen by the Kremlin. In his Independence Day speech today, Alyaksandr Lukashenka described "information intervention" as the main danger to independence of Belarus. According to him, external enemies of the country deploy the weapons of mass information to manipulate public opinion in Belarus. He has a peculiar understanding of independence. 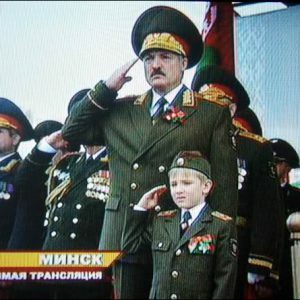 For Lukashenka, independence of Belarus means the same as his personal independence from other institutions and forces. At the military parade today, the authorities should have also demonstrated the modern tools which help them remain independent. At least three important things were missing – giant police trucks designed to transport detained protestors, plain-clothed security service agents who grab people in the streets and Internet warfare specialists, who block web sites and combat protesters on social networks. But these units were busy today fighting for independence of Belarus rulers from their people. The police trucks were patiently waiting for their passengers who were delivered to them in hundreds by plain clothed security agents during the day. Men in black promptly detained those who looked suspicious or tried to clap. The state IT specialists were busy with denial of service attacks on independent internet media. They also succeeded in blocking all large Belarus protest groups on the Russian social networking service Vkontakte. Despite their rhetoric and military parades, Belarusian authorities understand that controlling the spread of information is the key to their political survival. In today's Europe, using military force to unseat a ruler of another country is very unlikely. Fortunately, these times are long gone. Even Russia stopped short of using its army to unseat Georgia's president Saakashvili in 2008. The main threat for autocratic rulers comes from their own people who need to be kept either loyal or at least fearful. Mass media is the main instrument to achieve that. The protests organized by means of Internet only engaged a limited number of people. Most in Belarus gather their information from television and radio. Nothing can beat their hypnotic effect. State television and state radio are available in virtually every Belarusian flat. As a result, people learn political news from these easily available sources. They may also prefer not to watch the news at all or watch Russian channels, which are available in Belarusians a part of the standard package. Russia often criticizes and even offends Belarus authorities. However, the official Minsk learned how to filter such broadcasts. This filtering is not always effective, which undermines the state's nearly complete TV and radio monopoly. Russian media have their own agenda. For instance, they like to hint that if Belarus replaces its national currency with the Russian ruble, the economic problems of Belarusians will soon be over. They do not mention that it will also be the end of the country's independence too. Many analysts agree that Russia wants to weaken Lukashenka, but not interested to unseat him. The only alternative television channel for Belarusians is Poland-based Belsat. This satellite channel is primarily financed by the Polish Government, is structurally a part of the Polish public television but employs many Belarusian journalists. The channel's reach in Belarus is limited. Because of the lack of finance, they can only prepare less than an hour of daily Belarusian news coverage and cannot be watched without a satellite dish. Because of the economic crises, the satellite dish became a luxury unaffordable to many in Belarus. Belsat still does not have live internet broadcast. An effective improvement of its reach could be trans-border broadcasts to cover at least large border towns such as Brest and Hrodna. However, this has not yet been done. The role of Internet in Belarus is steadily increasing, but it is far from being the dominant source of information. According to a May survey of the Independent Institute for Sociological and Political Studies, 33% of the adult population in Belarus received information from the Internet and only 2.2% – from social networks. This 33% include those who never read any political news on Internet as well as strong supporters of the authorities. And the 2.2% using the social networks, even assuming if they all want to protest, cannot do much against the army of security agents. The state security services block social networks and fill Twitter and Facebook feeds with false and misleading information to disorient and intimidate protesters. As a result, the authorities are winning the information battle and Internet does little to dilute the effect of the state propaganda machine. As long as state propaganda succeeds in making Belarusians either loyal or fearful – it will take a long time before real changes will take place. However, if the economic decline continues, even the most aggressive brainwashing and sophisticated security services may fail.